Our History, Board, Constitution and Policies. As a result of a weaving class at the Free University at Western Washington University, Whatcom Weavers Guild (then called Whatcom Textile Guild) began. With the encouragement of weaving instructor Pat Spark, the students who took her class started meeting on an informal basis during June of 1971. Members of the guild during these early years were individuals known in the local community as creative, artistic and patrons of the local arts scene: Virginia Weller, Jane Grabert, Judy Krieger, Alita Thorsett, Cathy McCain, Patty Robison, Patti Mitchell, Jan Witcraft, Linda Rees. Meetings were held in a variety of locations – local businesses, churches, member’s homes, and the guild even maintained a rented space in Bellingham for a short period. By mid 1973, the guild held its first major workshop featuring Allen and Barbara Fannin. Workshops and organized programs at monthly meetings became the standard for the guild during its infancy. In 1974, the guild took a significant step by coordinating a major juried fiber show at the Whatcom Museum of History and Art. Fibers Unlimited became a popular guild show and museum exhibit throughout the mid 1970s and 1980s. One of the early show jurors was renowned designer Jack Lenor Larson. In conjunction with the exhibit, the guild held stunning fashion shows beginning in 1977. Although a popular (and time consuming) show and exhibit, the museum discontinued Fibers Unlimited during the late 1980s due to the changes in the museum’s focus, and a planned expansion. with an interest in fiber/textile arts is welcomed into the Whatcom Weavers Guild. 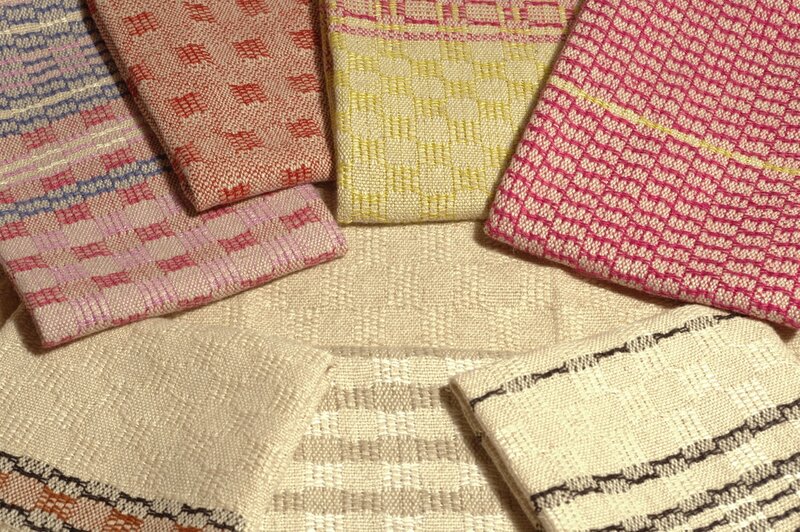 ​Whatcom Weavers Guild maintains membership in the Association of Northwest Weavers' Guilds (ANWG). This not-for-profit organization developed out of a conference organized by weavers in the Seattle, Washington area in 1957. Later, a more formal organization was created to promote and carry on the weavers conferences. This organization, ANWG, presents a biennial conference which"emphasizes the sharing in the camaraderie and enthusiasm of those with a common love of the textile arts..."
The name of this organization shall be Whatcom Weavers Guild. The location and principal place of business shall be Bellingham, Whatcom County, Washington. The purpose of this organization shall be to further interest in fiber arts with an emphasis on weaving. A. The officers of this organization shall be: President, Vice President/Program Chair, Secretary, Treasurer, Member-at-Large, Librarian, Workshop Chair, Membership Chair, Newsletter Publisher, Education Chair and Past President. Other members may be enlisted to help with specific tasks. Positions may be combined as needed if members are unavailable to fill all specific jobs. B. Officers named in Article IV-A shall constitute the Guild Board. C. The duties of officers shall be listed in the Guild Policies. D. The April program shall include nominations of new Board members. This list shall be published in the next newsletter. Elections shall be held at the May meeting. E. New Board members will take office after the June Guild meeting, for a period of one year. F. The Board shall be empowered to fill vacancies in office with the exception that the Vice President shall become President if that office becomes vacant. G. An officer may be removed from office by a two-thirds vote of the Board, provided the officer is notified, in writing, one week prior to the vote. The Guild Board shall establish and maintain Guild Policies by which the Guild shall be governed within the guidelines of this Constitution. Guild Policies may be amended by the Guild Board. A. Guild meetings shall be held every month, September through July, with the exception of January, for a total of 10 meetings each year. B. The Guild Board shall meet as the President and Board shall deem necessary. Dues shall be set forth in the Guild Policies. A. The Guild Board shall develop and approve the yearly budget. B. All funds of the Guild are to be spent for the activities of the Guild in keeping with its purposes. A quorum shall consist of those members who have paid dues and who are present at the vote. This constitution may be amended by a majority vote provided the amendment has been read at the previous meeting or published in the newsletter. In case the Guild is dissolved, all assets, after payment of debts, shall be distributed as the Guild Board determines, in accordance with the purpose of the Guild as set forth in Article III of this document. ​1. Guild membership is open to anyone interested in weaving. Active involvement is encouraged. 2. Membership. To remain active and receive an uninterrupted newsletter, annual dues shall be paid by February 1st. a. The Board will determine the dues amount, with consideration for student and family memberships. b. An individual may attend two guild meetings as a visitor before seeking membership. New memberships are accepted any time. c. A membership roster will be updated and distributed as needed, listing each member's name, address and phone number. Other information may be included as deemed appropriate by the Guild Board. In order to protect members' privacy, the roster shall not be provided and/or used for solicitation. a. The Guild’s fiscal year is January through December. b. The Board will establish an annual budget for planned expenses and income prior to the first Board meeting of the fiscal year. c. The Guild will establish and operate a bank account, using a checking account for annual budgeted operational income and expenses and a savings account and/or simple investment accounts, such as Certificates of Deposit, to accrue longer term deposits, e.g. income over and above annual expense requirements. d. During each operational year, the Board may decide to deploy money from the savings and any investment accounts for purposes of education and furthering the knowledge of weaving and fiber arts in the community or for the benefit of Guild members as a group. e. Decisions to deploy money from the savings and investment accounts must be made by the Board, based on proposals brought forward by the membership or members of the Board. Such proposals will be moved, seconded, discussed and voted on during a regular Board meeting; any approved proposal over $500 will be presented to the membership at a regular membership meeting for their vote and agreement. Notification of the proposed expenditure will be made to the membership via the Guild newsletter prior to the next membership meeting. f. Bills shall be paid by the Treasurer upon receipt of an expense form and related receipts and/or invoice. g. Two to three Guild members will audit the Treasurer’s books annually between January and March each year. 4. Workshops. Workshops are available to members and non-members. Workshop registration is on a first-come/first-served basis, with preference being given to Guild members, confirmed by payment of appropriate fees as determined by the Workshop Chair. a. The fee for a workshop shall be based on the estimated cost divided by expected registration. b. If the registrant is unable to attend and cannot find a replacement, workshop fees are forfeited. 5. Programs. Any member who presents an entire program will be paid an honorarium of $50. 6. Library. The Guild maintains a library of books and equipment which may be rented or borrowed by members only. a. A rental agreement or library card will be signed. All books and equipment may be borrowed for one month, with the possibility of renewal, and must be returned to the library/librarian. b. Purchase of educational materials or equipment shall be voted upon by the Guild Board. Payment shall be made from the Guild budget. 7. Newsletter. The Guild will publish a monthly newsletter during months the Guild meets. a. This newsletter shall be sent by e-mail whenever possible. Members without e-mail addresses may provide SASE to receive the newsletter through the postal mail. b. Members may place classified ads/notices in the newsletter free of charge. Members who wish to advertise as a commercial entity will be charged $5 per classified ad/notice. Any non-member wishing to advertise in the newsletter must make a $5 donation to the Guild prior to publication. Non-member Commercial entities must make a $7 donation. Display ad rates are published annually and available via the website. 8. Guild Board. Board members serve from June to June, with a joint meeting of the outgoing and incoming officers in June. a. Board members are required to attend Board meetings. Board members missing three meetings may be dismissed. b. Ad hoc committees may be appointed by the President. Ad hoc chairpersons may be appointed to the Board at the Board's discretion and are requested to attend Board meetings. They may present proposals but do not vote on Board motions. (i) Executive members – President, Vice President/Program Chair, Secretary, Treasurer, Past President. (ii) General members – Membership, Workshops, Newsletter, Education, Librarian, Member-at-Large. President - To preside at the board and regular meetings; to make sure the Guild policies and official records are kept up to date; to aid in the preparation of the new slate of officers; to appoint an audit committee; to see that a budget is prepared by January 1; and to appoint ad hoc committees as necessary. Vice President/Program Chair - To preside over meetings if the President is absent; to organize monthly Guild programs, coordinating with the Workshop Chair as appropriate, and arrange for 'Thank You' notes to be sent to all speakers; and to plan optional yearly Guild retreat. Secretary - To keep a written record of Board meetings; to notify local media of the monthly meetings of the Guild; and, with the Librarian, assure that Guild records are properly maintained and safeguarded; to see that the mail is picked up from the post office and that the information is properly disseminated. Treasurer - To maintain accounts receivable and payable in a timely manner; to maintain an up-to-date record of transactions and to give a monthly accounting of funds spent; to maintain a list of members from membership receipts and to submit said list along with membership books for annual audit; to submit membership information to the Membership Chair, Newsletter Editor and Member-at-Large. Past President – To provide continuity and support to the incoming new President and Board; to aid in the preparation of the new slate of officers. Member-at-Large - To foster the exchange of ideas and information between the Guild and neighboring guilds; to serve as the Guild's representative to the Association of Northwest Weavers Guilds (ANWG): to lend an ear to the ideas, suggestions and input of Guild members and express them to ANWG and the Guild Board as appropriate. Librarian - To maintain a current library of books, magazines, samples, slides, equipment and Guild historical records as well as a list of equipment and the location of each piece; to establish and monitor a do-it-yourself checkout system for library materials; to process for circulation any items to be added to the collection; to assist members in any research needs they might have; to share any new items of interest; to recommend and order new materials for the Guild library. Membership Chair – To encourage and facilitate new membership in the Guild, welcome visitors and provide information about the Guild; to maintain a database of members, containing name, address, phone number, email address, date of joining, craft interests; to organize and distribute a Guild roster for all paid members; to develop and maintain welcome and mentoring programs for all new members: to arrange for an appropriate place for regular meetings at the beginning of the year; to enlist members to help set up and restore the meeting room; to buy supplies as needed for meetings. Workshop Chair – To establish a program of workshops, for at least two years in advance, coordinating with the Program Chair as appropriate; to organize and oversee all the workshops. Newsletter Publisher - To write and distribute a monthly newsletter to paid members. Education Chair – To research and propose opportunities for the Guild to provide education and information to the community on fiber arts, with specific focus on weaving; to create and maintain a roster of members willing to participate in external education opportunities; to be the contact person for education and shows in the community. 9. These policies may be amended by the Guild Board, with changes to be published in the next newsletter.